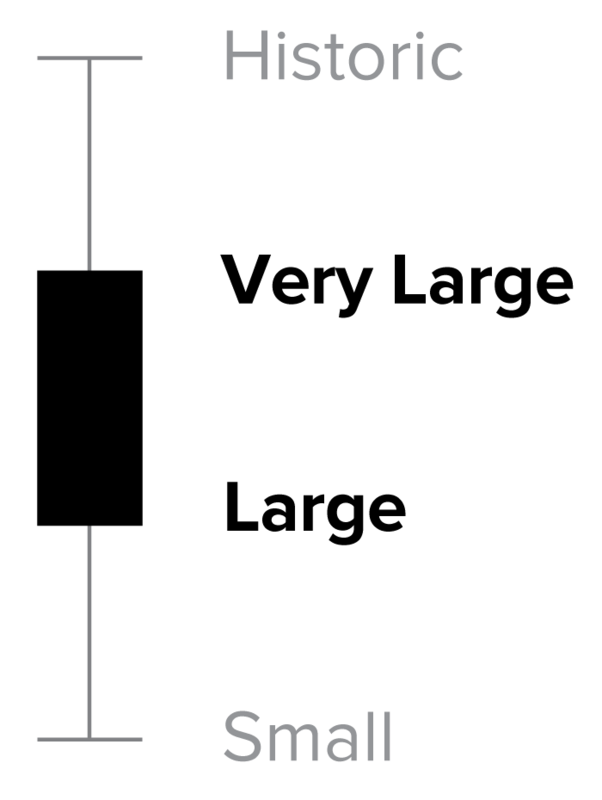 Extreme or high avalanche danger occurring or expected to occur within 24 hours: at least high danger in all three elevation bands. Warning conditions expected within 12-48 hours. Forecasters expect the probability of a Watch to increase to Warning conditions in the majority of cases within the above timeframe. A Special Avalanche Bulletin is issued when significant public use is expected and dangerous avalanche conditions exist, but the avalanche conditions do not meet the level necessary to issue an Avalanche Warning. Heightened avalanche conditions exist on slopes steeper than 35. Large and destructive Glide avalanches and cornice falls are possible where rain has saturated old snow. Avoid terrain with open cracks in the snow and overhung cornices near ridge lines. The Day 2 avalanche danger outlook is different than the Day 1 avalanche danger forecast. The Day 2 avalanche danger outlook has a higher level of uncertainty in the regional avalanche danger but can still show the expected danger level trend versus the Day 1 forecast. Also, the Day 2 avalanche outlook does not have avalanche problems defined as a result of the increased uncertainty. Above Treeline is the highest of the three elevation bands used in NWAC forecasts. It includes alpine areas where the most snow falls and the winds are the strongest. Above Treeline is not an exact elevation, but a characteristic of the terrain, beginning as the treeline transitions into open slopes extending to ridges and to the tops of the ridges or non-volcanic peaks and to the cascade crest level on the Cascade volcanoes. Due to the lack of high alpine snowpack data available to the forecasters, the upper limit roughly corresponds to a 7-8,000 level. An avalanche that started above treeline and ran to lower elevations. Heightened avalanche conditions on specific terrain features. Evaluate snow and terrain carefully; identify problem features. Near Treeline is the middle of the three elevation bands used in NWAC forecasts. It is a transition zone between dense forests and treeless alpine areas. It is the narrowest of the three elevation bands, extending only a few hundred feet above and below the treeline. 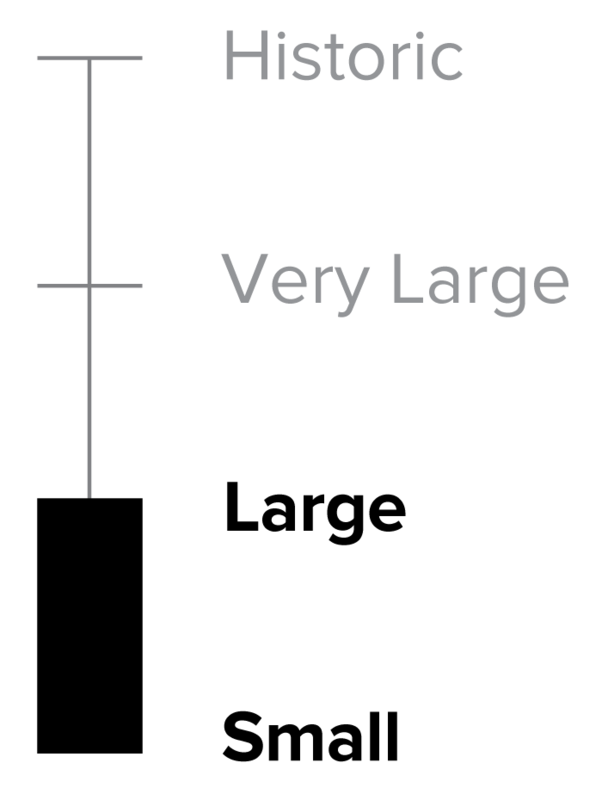 It varies locally, and is not a constant elevation or width. An avalanche that started and ran near treeline. Generally safe, watch for unstable snow on isolated terrain features. Below Treeline is the lowest of three elevation bands used in NWAC forecasts. It extends from valley floors, or snowline, to Near Treeline. Open areas and sparse trees are possible. Snowfall tends to be less than the other elevation bands. Tree cover shelters the snow from wind effects. Avalanches on open slopes below treeline. The North American Avalanche Danger Scale is a tool used by avalanche forecasters to communicate the potential for avalanches to cause harm or injury to backcountry travelers. Avalanche Problems are categories of avalanche activity. The Problems may not describe all avalanche activity you might observe, but they categorize the avalanches by how we manage the risk in the terrain. This approach focuses on relevant observations you can make in the field and how to treat the avalanche risk. The forecasts list up to three current Problems, along with the spatial distribution, the likelihood of avalanches, and anticipated size. Forecasters may provide specific details to a Problem in the Discussion tab. This link has detailed descriptions of each Avalanche Problem and suggestions for risk treatment. Glide avalanches occur when water lubricates the interface between the snowpack and the ground. These avalanches are difficult to predict and best managed by avoiding terrain below glide cracks. The Aspect/Elevation diagram describes the spatial pattern of the Avalanche Problem by aspect (the direction a slope faces) and elevation band (Above, Near, or Below Treeline). 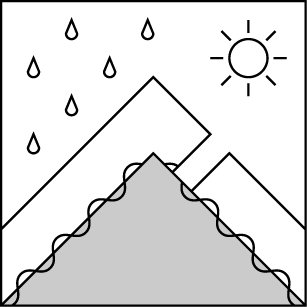 The diagram will be filled with black where the Avalanche Problem may exist. 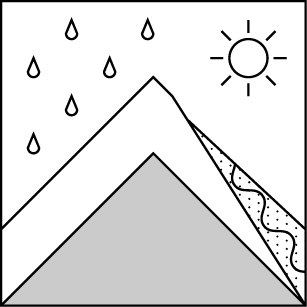 You can view the diagram as you would a mountain on a topographic map. The outer ring represents the Below Treeline elevation band, middle ring Near Treeline, and the inner ring Above Treeline. The diagram is oriented like a compass, with the top wedges representing north aspects, the left wedges representing west, etc. 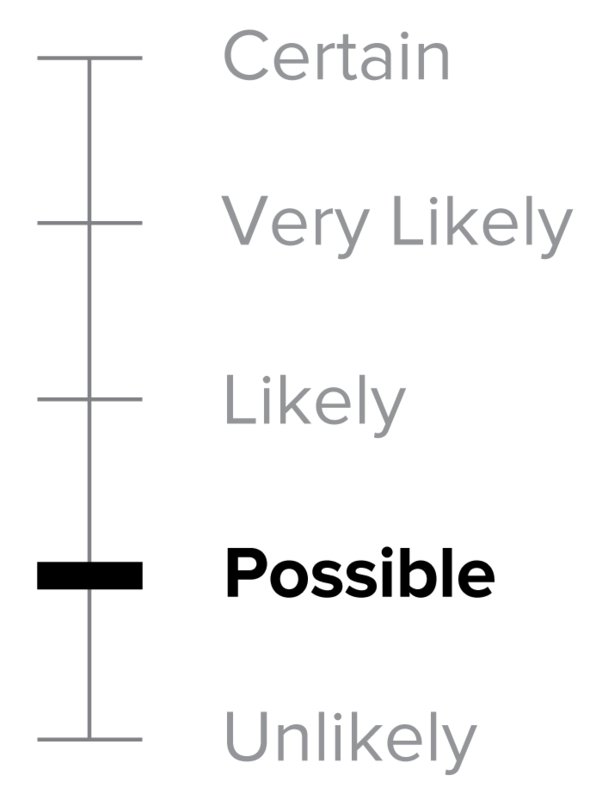 Likelihood is a description of the chance of encountering a particular Avalanche Problem. It combines the spatial distribution of the Problem and the sensitivity or ease of triggering an avalanche. The spatial distribution indicates how likely you are to encounter the Problem in the highlighted avalanche terrain. The sensitivity indicates how easy it is to trigger avalanches including both natural and human triggered avalanches. Size is based on the destructive potential of avalanches. SMALL avalanches are relatively harmless to people unless they push you into a terrain trap. LARGE avalanches could bury, injure or kill a person. VERY LARGE avalanches could bury cars, destroy a house, or break trees. HISTORIC avalanches are even more destructive, and nearing the maximum size the slope could produce. While avalanches will be difficult to trigger today, they could have serious consequences. Glide Avalanches and cornice falls could be big enough to bury or kill you. Both of these types of avalanches form in specific types of terrain. The best way to stay safe is to avoid areas where these avalanches form and release. Watch out for slopes with visible glide cracks or where known rock slabs lie under the snowpack. Give yourself an extra wide margin of safety near ridges that could hold cornices, and avoid slopes with cornices overhead. Many Loose Wet avalanches ran in the past couple days. This avalanche cycle is tapering off but is still possible today. While these avalanches may be the smallest and most predictable of today’s avalanche flavors, they could still be big enough to injure you. Avoid traveling through or above terrain that could increase the consequences of being caught in an avalanches such as or cliffs, gullies, or rocky slopes. Wet weather over the weekend created moist to wet surface snow conditions up to 6500 feet. A natural Loose Wet avalanche cycle occurred Friday and Saturday. Observers reported both natural cornice falls and glide avalanches. We’ve received minimal reports of Wet Slab avalanches. Poor visibility and stormy conditions have limited observations at higher elevations. Across the region rain totals averaged 1” during daylight hours on Sunday with 1.06” at Steven’s Pass, .95” at Snoqualmie Pass, and .88” at Paradise on Mt Rainier. NWAC Avalanche Forecasters and observers noted numerous natural wet loose avalanches on all aspects Friday and Saturday. These avalanches ranged from small to large, with some travelling 1000 vertical feet. Crystal Mountain Ski Patrol reported skier triggered wet loose avalanches in terrain with an uncompacted, backcountry-like snow on Saturday. This information is provided by the U.S.D.A. Forest Service and describes general backcountry avalanche hazard and conditions. It does not apply to ski areas and highways where avalanche mitigation is conducted. Read more here.